Are you looking for a way to supercharge up your blog posts? 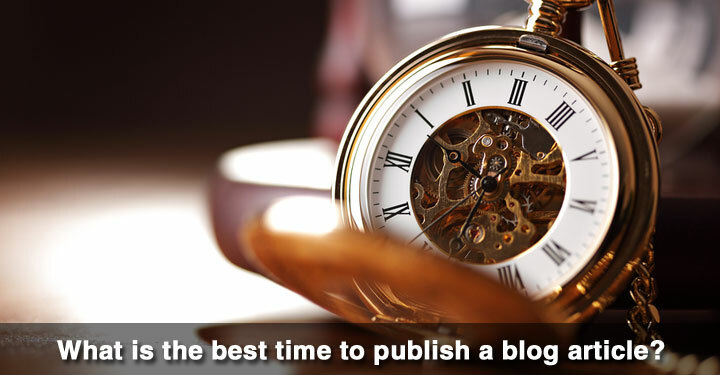 What is the best time to publish a blog article? Bloggers are a rare and distinct sort of people. We pour our hearts, souls and time into articles. We strain over the titles. We look up words in the thesaurus to find to perfect word to describe exactly what we want to describe. We wake up at 5:30 am just to write. It would be an absolute shame if all that hard work was wasted. Today, I wanted to take on the question of when to publish a little further. Let’s find out not only what day is the best, but also what time is the best to hit publish. In the last 6 months, we changed the day that we publish this series. We originally posted this series on Tuesday, and that worked out really well for a while. Then, we changed and started posting on Thursdays. Almost immediately, we noticed a difference. Our engagement went down, our shares went down, and our articles just weren’t getting seen. After doing some research and reorganizing my week, Robin and I decided to post on Mondays. In our article, Absolute Best Day of the Week to Publish a Blog Article?, I shared in detail about our little experiment and what influencers like KISSmetrics and Shareaholic have to say. The answer to the best day to publish is, hands down, Mondays. I know, I know…everyone publishes on Monday, but there is a reason for that. As soon as we started publishing on Mondays, we saw an instant reaction. Engagement has increased. That’s the bottom line. More people are liking, sharing, and commenting on our posts. Another nugget I noticed, however, isn’t just posting on Monday. There is a certain time on Monday that induces more engagement than others. KISSmetrics says the same thing. In a beautifully simple infographic, they reported that 70% of users read blogs in the mornings. Shareholic and Social Fresh say the same thing, too. Social Fresh says that 27% of content sharing happens between 8 am and 12 pm. Shareholic published its own beautifully simple infographic that shows a spike in sharing from 9 am – 10 am. Shareaholic also reported that the peak time for readers to read blog articles is from 9 am – 10 am. On our blog, we have seen the same thing. Articles that are up and on social media sites and in email inboxes by 9 am Monday morning get more exposure than other articles. I wish I had a different answer than reaffirming the Monday 9 am rule. In my mind, the answer should go against the grain. It should be a cooler answer that wears hipster sun glasses and has a graphic T-shirt on. The truth is that the answer isn’t wearing hipster sunglasses or chewing bubble gum. You and I work hard and we want to give these articles a fighting chance. A Little Nugget: You don’t have to post on Monday. There is a world of other options like posting on Sunday or Saturday and catching the weekend crowd. However, there is a value to having your article ready to go by 9 am Monday morning. If that means posting on Sunday and waiting to share it on social media till Monday morning, cool. Here’s what I’m saying: blood, sweat and tears shouldn’t be wasted. In fact, the work produced should be given its best chance. When do you publish blog articles? Do you follow the 9 am rule? Do you follow the Monday rule? Or do you know something I don’t? I would love to hear your thoughts on the absolute optimal time to publish a blog article. Please let me know your thoughts in the comment section. Great info! I’ve always wanted to test Mondays … In fact one of my goals for 2014 (which I haven’t been able to meet yet – doh!) is to publish blog posts twice a week, on both Mondays and Wednesdays. Wednesday is our regular day … maybe I should switch it around and give Mondays a test! I got this blog in my mail this Monday morn & was intrigged by title and intended to open and read it. Then things got in the way and Im reading it as part of a group I participate in a little after noon. This group posts blogs to social media on weds. So does a few other groups. Maybe they will switch. I could publish on Sun night if I had it ready. Will play around with it. Thanks for the info. Good stuff! It makes me want to test Mondays, too. I usually post on Thursdays, and after trying Tuesday and Wednesday, went back because the level of engagement was a lot higher, particularly over the weekend.